Life Candy: Excalibur! 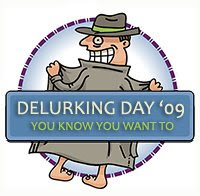 It's Delurking Day!!! Yup, it's that time of the year when we cajole, beg, taunt, harass, threaten, and politely invite every single one of readers to put hands to keyboard, hit the "comment - add yours here" link, and say "hi!" If you've been here before, commented a lot, are new to this blog (welcome! ), read but have always been too shy to say anything, please make your presence known! It doesn't matter if you just say "Yo!". Just do it! Anyway, Helen Mirren played Morgana, but of course, even though I've seen this movie millions of times, her name just wasn't coming to me at the time. So I, of course, had to pull up IMDB.com, and look it up. I completely forgot that Liam Neeson and Patrick Stewart were in it too! Then I had to read up the movie's Trivia and Goofs... of course. What? Helen Mirren played Morgana? Well, I never knew that. Haven't see Excalibur in ages, though. I did watch Galaxy Quest again recently, and I was surprised because I recognized so many actors... Justin Long, the guy from Veronica Mars, the guy from the Office, the guy from Monk. Ok, granted, I don't know most of their names, but they are all familiar faces. Ha! you thought I couldn't do one-word answers, and...Dammit! yo, just trying to delurk! *lurk lurk lurk* Ack! She's on to us! Run for it!